Michael Nelson’s natural perception of the nuances of seafood can be traced back to childhood summers in Maine. While his mother worked as personal chef for the Rockefeller family, Nelson was busy setting lobster traps in Bar Harbor, where locals would pay him in crustaceans. His fascination with the culinary world dovetailed into his first job working under Master Chef Bob Brusinski at Public Landing and Tallgrass, two of Brusinski’s renowned Chicago restaurants, beginning at just 16 years of age. Once he received this practical experience, Nelson went on to attend the Culinary Institute of America in Napa Valley, California. Following graduation, Nelson gained tremendous experience cooking at some of the most highly regarded restaurants in Chicago and Seattle, including the Georgian Room at Seattle’s Four Seasons Hotel. 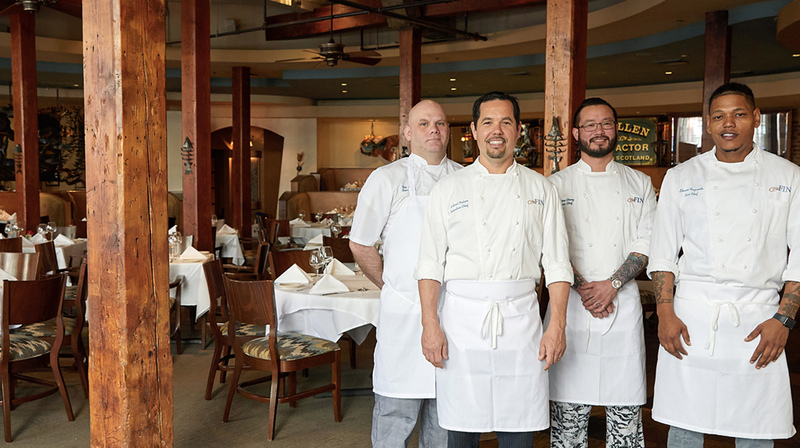 From the time he arrived in New Orleans in July 2005, Chef Nelson has been an integral part of GW Fins’ Culinary Team. His acumen was clearly recognized and Nelson quickly rose from GW Fins’ Sous Chef to Chef de Cuisine and eventually Executive Chef. Nelson’s innovative work utilizing the brightest flavors and juxtaposing textures to highlight each variety of seafood can be recognized in dishes such as Firecracker Tuna Tacos, innovative garnishes for the freshest Crudo imaginable and his signature entrée; Scalibut (Scallop Crusted Halibut). Although known for serving more than a dozen varieties of seafood every night, guests also flock to GW Fins for Chef Nelson’s non-seafood appetizer, Crispy Pork Belly with Compressed Watermelon and a dessert that blends his childhood favorite with New Orleans flair; Ban-nilla, a combination of Nila wafers, banana ice cream, Foster Anglaise and Banana Brule. Tim was born into a family of cooks in Syracuse, New York and was enthralled by the food industry at a very young age. His devotion to cooking and his strong work ethic put him on the culinary fast track and he soon became Sous Chef at several upscale restaurants in Central New York, including the esteemed Julie’s Place in Syracuse. Following a long-time love affair with New Orleans, Tim moved to the Crescent City in 2013 and immediately began working at GW Fins. His creativity and innate understanding of seafood provided Tim the tools to move from Line Cook to Sous Chef in a matter of months. Growing up in Europe, Nelson realized early on that he wanted to choose a career that would provide people with a positive experience, and ultimately give them pleasure. Working in the kitchens of some of the top restaurants in the world, from The Ivy in London to L’Atelier de Joel Robuchon in Hong Kong and WD-50 and Masa in New York, Chang has gained tremendous gastronomic experience. As GW Fins’ Sous Chef, he considers himself lucky to be working alongside Chefs Tenney Flynn and Michael Nelson, garnering their vast knowledge of seafood, and making his culinary imprint on the food that is served every evening. Kyle was born in Connecticut and moved to Covington, Louisiana in 2011. At the ripe age of 17, he became the Sous Chef at Another Broken Egg Cafe, where he gained leadership skills and furthered his cooking skills. Following his time at Another Broken Egg Cafe, he stepped into another management role, but this time in the front of the house. For a handful of years, he served as the manager at Mellow Mushroom, before entering the world of fine dining, where he became a line cook at Delmonico. His time spent working under Emeril Lagasse’s umbrella provided him with an array of sophisticated cooking techniques that lead him into the kitchen at GW Fins. Kyle served as a vital part of the culinary team at GW Fins, demonstrating his knowledge of seafood, his work ethic, and his leadership skills, before earning himself the esteemed role of Sous Chef.